I wanted to share with you a quick post. I was planning on uploading a video today but somebody forgot to return my memory card and sim reader to me (ahem the BF), lol, so it will probably go up tonight. Instead, i'll be featuring a bridal trial I did a few weeks ago. One of my viewers actually just moved to Atlanta and contacted me about doing a trial. It's always fun working with a viewer because they tend to be very knowledgeable about makeup! My client was super friendly and already naturally gorgeous. I knew that it was going to be a fun trial. To see the before and after, click here! My client brought a lot of pictures of gorgeous celebrities like Sanaa Latham and Alicia Keys. She wanted something a little smokey but still natural. During the trial, we went through several looks to see what suited her best. We also focused on evening out her skin tone. The looks featured a plum theme using MAC's star violet eyeshadow and various brown shadows. We went for a plummy lip close to her own lip color. It's a very bridal look but still has some color. When I do a bridal consultation, I always recommend that the bride wear the makeup for a few hours after to see how it holds up. That way, I can tell if I need to make adjustments. For example, if they felt a little oily, I can use more shine-control products...or if there eyeliner smudged...I can make sure to use primer underneath and set with shadow. In this case, my client felt a little oily so we might try to mix up the foundation. I'll be working with her again soon on her engagement pictures and I can wait to share with you another look. This is lovely. I feel that plums and purples can really be that "other" neutral shade. She looks lovely, awesome work! Great look and wonderful recommendation. I never think about telling them to keep the makeup on for a few hours to see how it feels. Definitely will be doing that from now on! She looks gorgeous! Good job Ren! 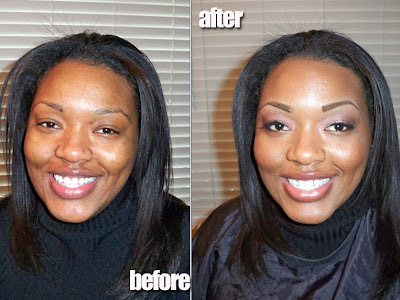 Holy moly her eyebrows look SO perfect in the after shot! What did you use? You also evened out the skin so well! Tutorial pretty please? Beautiful work as always Ren Ren! LOVE the makeover, and her skin looks gorgeous! Goodness this is beautiful! LOVE the precision of the brows and it just came out so natural and beautiful. wooow :) sooo prettyy. love it :D great joob!! Ren, I am loving this look! I would love to see you do a tutorial on this. I think this would be a great spring look and I wanna try it out! Sorry my english but I'm brazilian and speak only portuguese.